UK Autodrive has been working with Guide Dogs for the Blind to make its self-driving ‘pod’ vehicles more accessible to the visually impaired. A group from Guide Dogs for the Blind – together with their canine companions – visited the headquarters of pod manufacturers RDM Group in December for an early ride in the autonomous vehicles, ahead of the start of public-space trialling in Milton Keynes. The charitable organisation, which helps blind and partially sighted people across the UK, has been involved in the design of the pavement-based pods since the summer of 2016, with December’s meeting offering the group a chance to try out some of the changes introduced since then. 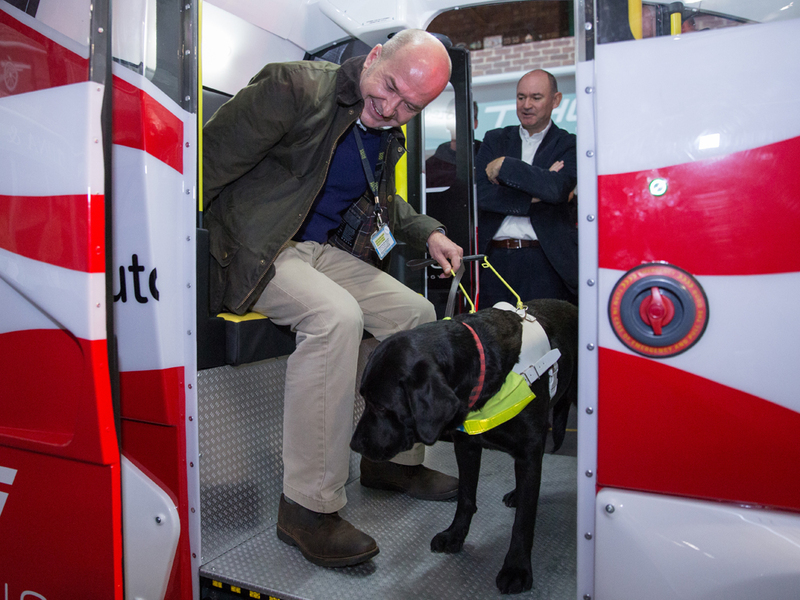 “It’s great to have Guide Dogs for the Blind here, so that we can continue to benefit from their input into the vehicle design,” said RDM Chief Engineer Jez Coates. “Since our first meeting with them, we’ve gone through the process of designing Pod Zero – the pod that we’ll be deploying in the UK Autodrive programme – and we’ve incorporated a number of new features to help this particular user group. Guide Dogs’ Community Engagement Office Clive Wood, whose area of work includes the Milton Keynes region, was among those taking a test ride in the autonomous pod, accompanied by his four-year-old black Labrador, Winnie. “To be honest, I could have been sat in the back of a regular car,” Clive said with a grin, after stepping out of the pod. “But that’s a good thing, because it means you’re getting all the benefits of a self-driving pod, but it feels just like sitting in a very quiet car. “Today has also given me the opportunity to understand how the autonomous pods could be a real benefit for the visually impaired community, as well as for the wider community. UK Autodrive will be trialling up to 40 self-driving pods in pedestrianised areas of Milton Keynes by the end of the project in October 2018, with the first set of vehicles due to begin public-space trials in the coming weeks.